NDIAA�maybe bang in the midst of a music boom with star DJs and hit bands making Bangalore their stop. But before we happily give ourselves the moniker of the most welcoming host city, a band from Germany, called The Ocean Collective, did not have the greatest experience recently. The Ocean Collective, a progressive metal band from Berlin, was invited to play at a large beer festival in namma Bengaluru. As is the norm, all international bands and artistes are paid in advance. Reportedly, the band backed out of the gig as the management of the festival declined to pay at the last moment. That was just the beginning. The band members were then held hostage by the 5-star hotel they were staying in because the hotel payment was also declined by the same folks who manage the festival. If you are reading this, then you must visit the banda��s Facebook page and read all about the incident first hand. The Ocean Collective eventually performed a free gig at a club in Indiranagar, thanks to Salman U Syed of Bangalore Open Air Festival. They have since returned home and will probably shrug the incident off, but the bad vibe will take a much longer time to dissipate. This especially at a situation where credibility of Indian music promoters has always been a big question mark for international bands over the years. I hope promoters of live music will show more maturity and sensitivity when it comes to handling artistes and their logistical issues, rather than leaving them stranded a�� literally. 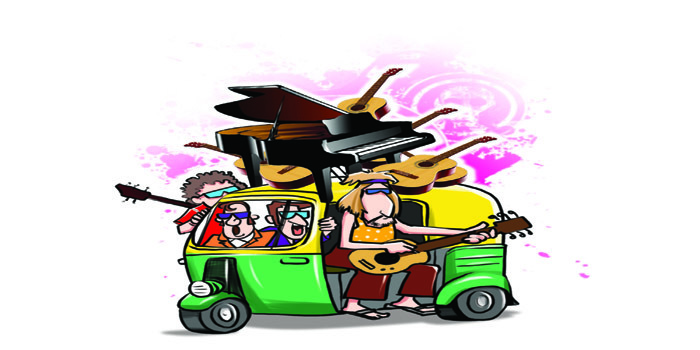 The Ocean Collective had to hire four autos to fit their equipment in just to reach the club at Indiranagar.